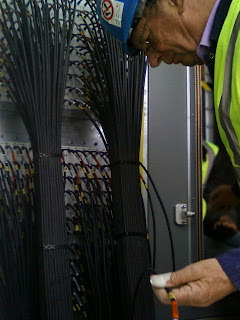 As the LBA cables were going into place, the patch panel within the RF container was slowly filling up. After what seemed an eternity, the last cable was drawn through and patched into the cabinet and the panels were complete. Dave King prepares to insert the last cable into the patch panel and then complete the cable-dressing. 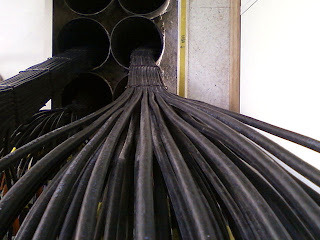 Looking down from the HBA panel, into the duct from whence the cables arrived from the antenna field. Look at how little of the 200mm duct was used in the end... how's that for neat? In fact, there's an open challenge to any other LOFAR station to do better! All done. 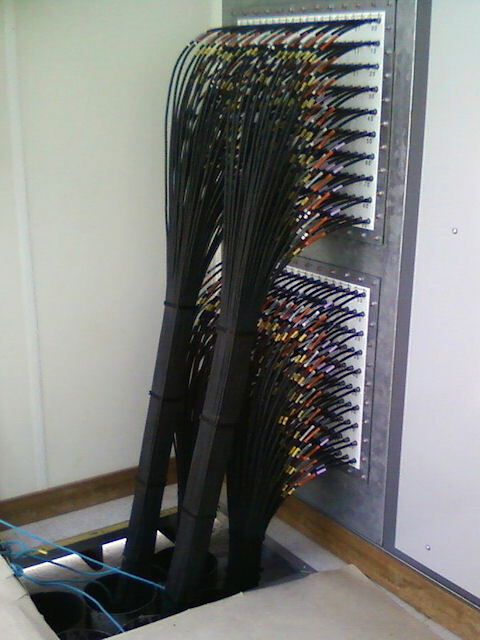 The HBA (top) and LBA (bottom) patch panels, fully populated and ready for the next phase of the LOFAR construction process.